Why? Asked A Photographer of Butterflies. Fond? Not strong enough. Really like? Not that either. This image evokes stronger for me, Love. I love this Tawny Emperor butterfly image. Comes the question, why? Why too, in a ‘Media library’ of more than 700 images, do a very few of them earn the ‘Love’ sentiment? Seek/chase/search/scour habitat for butterflies, and you will be skunked (disappointed) much. It may rain when you reach your destination, or it may be too dry, hot, or devoid of critical hostplants or those very same hostplants may be set in a place that butterflies just don’t go to. It may be too windy, or bad weather may be on its way, and I often wonder if butterflies don’t pre-sense that. All this to understand that when we score a unique image, all of these negatives have not deterred. Tawny emperors are not common, not usually encountered. 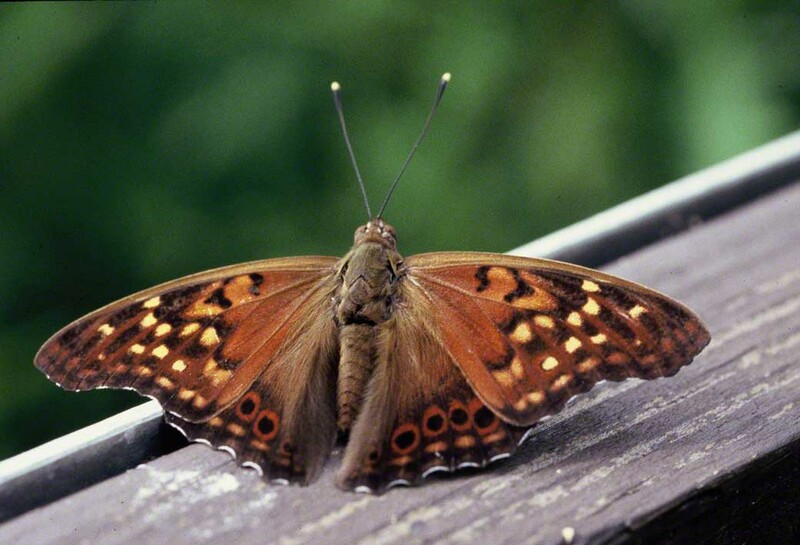 The closely related Hackberry emperor is common. This particular Tawny was the first I had ever seen, what friends would call a ‘Lifer.’ That on that morning I shot out at least 40 or more exposures, reminds of how much I wanted to leave there with good stuff. Uncommon butterfly, sweet image = another reason that I ‘Love’ this image. Aspects of the image? Fresh, fresh individual, with good color capture. Eye-friendly background (green leaves, blurred by the work of my Macro- lens (100mm/2.8 Canon). Near universal fine share of wings, body, head, eyes, antennae. To this add that this Tawny was comfortably sitting on the horizontal member of a wooden trail marker at Raccoon Creek State Park in Beaver County, in southwestern Pennsylvania. Butterfly perched at a tantalizing angle with reference to that hardwood platform adds to the eye-fascination I have always had for this look. Personal affinities? I love browns, and this is a study of browns. I have always thought that those 4 wings look way oversize, as if this flier could barely rise from the board (after it decided that more 40+ captures were enough, it shot away at shocking speed, in a direct path, some 5 feet or so off the ground). The near mystical. Had I arrived minutes before, or minutes later, I would Never have met this comely beauty. To that add that Miriam and others whom I admire have generously praised this photo, and well, that pleases me, alot. A brief discussion of why? from someone who thinks about this, once again, alot. Mirrors bedevil so many of us. A look in the mirror, and we are awash in thought. With Hollywood and sports celebrities almost always before our eyes, we look at that mirror, and well think . . . . What will ‘they’ think when they see me looking like this? Must be that we are among the few critters that fret about appearances. After decades in the bush, I offer this, butterflies don’t fret. This Red Admiral butterfly must have eclosed some weeks before. A beaut when it left the chrysalis, this view shows significant loss of wing scales, revealing scratches and areas lacking full scale coverage. But G-d didn’t install mirror anxiety in this brushfoot butterfly, and not a second is wasted, fussing or primping. No need for that anyway, what with these handsome reddish-orange bands and wing margins, white forewing spots and look, see those baby blue spots at the trailing edge of the hindwings and perfect pair of white antennae clubs. Some of my new adds in my Pittsburgh garden have been excellent: Common milkweed, Mexican sunflower (not a native, but a winner! ), Asters,Greenhead coneflower. Others have disappointed: Clethra, sadly, never took. I planted 3 Buttonbushes ( Cephalanthus occidentalis ) in our ‘peanut’ garden in June. All three flourished, but have a lot of growing to do, to reach that 3′ – 10.’ They prefer ‘wet feet’ in moist soil, and that part of my garden usually retains good moisture. 2017 may, should bring our first nourish of blooms, hopefully like these, met at the rich reserve of the Jamestown Audubon Center, in western New York State. Just down that same trail, I met a nice population of Baltimore Checkerspot butterflies. Nice trail that. Wetlands give. Variegated Fritillary Butterfly in . . . October . . . Seen in . . . ? This here 2016 has produced many surprises for me. In Georgia, in Maryland, in western New York, in Israel and in My Own Pennsylvania. Count the biggest surprises, the absence of butterflies I’ve seen here in western Pennsylvania, countered by the wild abundance of butterflies in Georgia. Elevated we were, sun bright and friendly, as we reached the front fence of our garden. 10/5/16 should not merit a close look at the bed of giant zinnias. It’s too late here for most butterflies, No? On Friday I did see a worn Monarch female at these same zinnias, and yesterday I marveled at a fresh (fresh!) female Gray hairstreak. So we stopped, and Huh? Do I see what I see? A Variegated fritillary butterfly, just like this one (at Blackwater National Wildlife Refuge, Cambridge, Maryland). A female I think. Methodically working one zinnia bloom head, and the next and the next. Cech and Tudor’s Butterflies of the East Coast‘s range map shares that in my state they are ‘scarce/seasonal range.’ They report that there is evidence of limited overwintering, probably as adults. Will her days end in Pennsylvania, USA, as the days grow colder? Will she find a crevice in a local park tree, and endure our zero degree winter days? Finally, I just returned from Georgia, and saw many Variegated frits in the Butterflies & Blooms Habitat in Eatonton. Oh, are they difficult to photograph! My 52 rolls of slides just arrived today, courtesy of FedEx. Who knows if I will have a single Variegated image that qualifies as a . . . keeper. But just an hour ago, on my own October surprise giant zinnias, there was this southeastern winged beauty, though Petra truth be told, paid no attention. It’s special when you encounter an animal or plant that is extremely rare. We all pause, and approach, and examine, and show respect! We are obligated to consider how extraordinary this thing that we see is, how intricately it is constructed, how well adapted it is to its very special habitat. We may also fret, realizing how a pinpoint mega-storm can wipeout these small populations, living in their unique, threatened habitats. Me, I then remember to be Thankful for the opportunity to have met such special fauna or botany. You may know that in the ’80’s I was a NYNY realtor. I know that place, where every single square inch has been developed, and I think, Hope that unchecked development can be checked by you, who are along here, and who . . . care. Phil, my friend in Georgia is a Naturalist, employed by the Georgia Department of Natural Resources. He, with his family along, guided me that 2016 morning. We hiked to a very special, restricted habitat in Panola Mountain State Park. We were seeking Juniper Hairstreak Butterflies. Here on this granite hilltop, we found them. And we found other hard to find wildlife. This Lichen grasshopper is a rare, very specialized insect, found in diverse, limited habitat. Phil’s eagle eyes spotted this one. I did all, all of the above, and then worked to photograph it. Here we are, eyeball to compound eye, with a tiny, threatened grasshopper that depends upon the lichens growing on remote granite hilltops. Truth be Told, I felt honored to have made its acquaintance. If Georgia keeps up its exemplary work, future photographers will revel at the same opportunity.